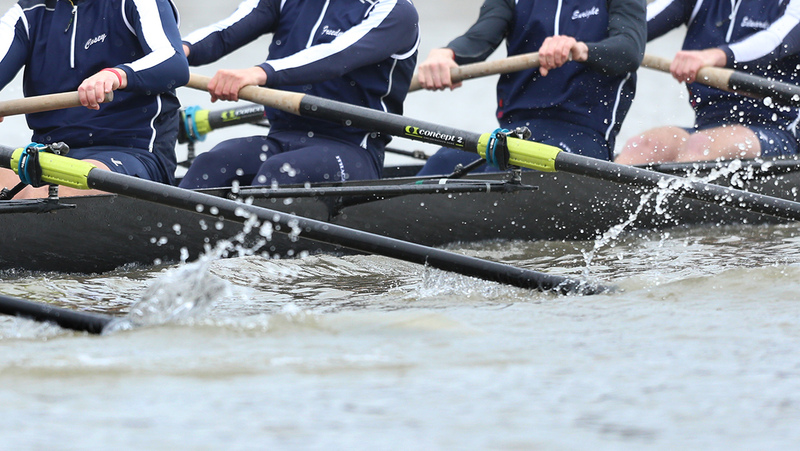 After a 12th-place finish at the National Invitational Rowing Championships, the Ithaca College men’s crew is looking to have a successful season in the Liberty League Conference. The team will be competing in the Liberty League for the first time, which means the Bombers will get to compete for a conference championship. Senior captain Stephen Cadoux said this is the first time the men’s team will be racing in a conference, as the team doesn’t compete in the NCAA. He said he is excited to compete for a conference title. Out of 32 men on the roster, 28 of them are underclassmen. Head coach Dan Robinson said his younger rowers grow of the season for the team to have success. Robinson said that he wants to try to get more of the underclassmen to stick with rowing so that the team has a more balanced roster for the upcoming seasons. Cadoux said that he is excited about the underclassmen’s potential. Sophomore Andy McCabe said that everyone on the team has formed a close bond with one another and that it is a good thing for the future of the team. “Since we are so underclassman-heavy, we want to make sure that the underclassmen stay with it and can build our team bigger and bigger,” McCabe said. Robinson said that every season is a new season and that it is important to stay and live in the moment and to not think ahead all the time. He said the team should enjoy the experiences and bonding moments with the teammates and keep improving every day. McCabe said the team’s big focus is building one another up constantly. Not only is it the first time that the team will be competing for a conference title, but Ithaca College rowing is celebrating its 50th anniversary at 11 a.m. April 28–30 at the Cayuga Inlet. “It’s the 50th year of Ithaca rowing, and we wear wristbands that say ‘50th armada,’ so we’re thinking about the legacy that we are carrying and the 49 years before us,” McCabe said.